Welcome to ExamNotes by CertBlaster! In Objective 5.2 Given a scenario with potential environmental impacts, apply the appropriate controls, we will look at some of the ways we can control the negative impact of the materials we handle on the environment. This Part 1 of 2 covers all exam objectives up until Protection from airborne particles. The Hazard Communication Standard (HCS) requires chemical manufacturers, distributors, or importers to provide Safety Data Sheets (SDSs) formerly known as Material Safety Data Sheets (MSDSs) to communicate the hazards of dangerous chemical products. The Occupational Safety and Health Administration (OSHA) requires that the employer maintains an MSDS or SDS for every material that poses a risk to personal health or the environment. Data sheets are to be kept in a location where they are accessible by the employees. If you are ever unsure about the use or disposal of anything, ask for the MSDS (SDS) for the material. Computers are sensitive to high heat levels. They will operate unpredictably in extreme cases. Always be sure to provide the proper ventilation to your components to avoid heat buildup. You should also be aware of the humidity levels. Low humidity prevents the free flow of static electricity. When static electricity builds up you have a condition that supports ESD. The computer relies on a consistent reliable voltage level to operate properly. If either the flow of electricity is interrupted or if the voltage fluctuates the equipment will fail. A power surge is a brief overvoltage condition called a voltage spike that can do damage to a system. A brown out is a brief under voltage condition that will cause equipment failures. A blackout is an absence of electrical energy. A battery backup provides a consistent reliable power supply to the equipment. The battery backup runs the equipment from a battery supply that is constantly being charged. The equipment is running from a clean stable power source. The UPSs are rated by wattage and Volt-amps. 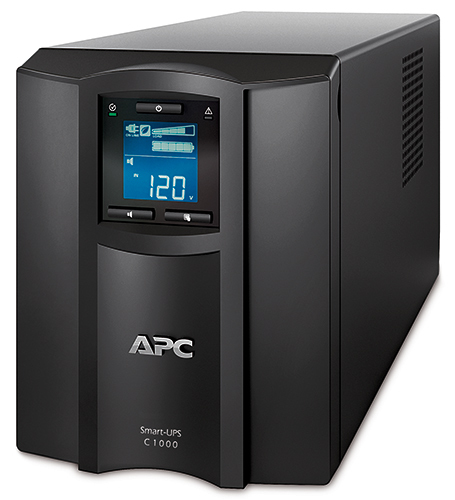 When selecting a UPS it is best to calculate the anticipated load and choose a power supply that is rated approximately 40% higher. e.g. a 600W load calls for 1000W UPS. This extra headroom will provide longer runtime in a power failure and will not overly tax the unit. UPSs provide protection against surges, brownouts, and blackouts. A provides protection against voltage spikes. When the surge suppressor senses voltage higher than its rating it trips an internal breaker cutting power to its outlets. Once a surge suppressor has been triggered it needs to be replaced. If it has an indicator light, the light will flicker. 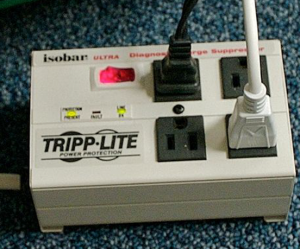 Also, many surge protectors contain phone jacks. If they are present use them, Electricity can use any physical connection to enter your system. Your phone or modem is not capable of handling high voltage. In our example, you can see that this unit has indicators for Line, Fault, and Protection status. That wraps it up for Part 1 of 2 of A+ exam objective 5.2! Good luck on the test!